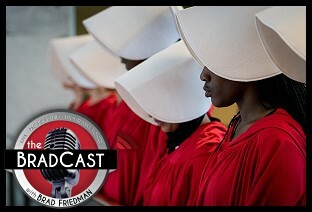 " The Unsettling Truth About 'Settled Law', Brett Kavanaugh and Roe v. Wade: 'BradCast' 9/7/2018	"
« PREVIOUS STORY "'Uncharted and Unprecedented...The Process Has Broken Down': 'BradCast' 9/6/2018"
"The Unsettling Truth About 'Settled Law', Brett Kavanaugh and Roe v. Wade: 'BradCast' 9/7/2018"
Politics has now been proven to be a psychological domain (How To Identify The Despotic Minority - 3). Is the "red-shift" still a factor anymore, in terms of being able to detect one occurring? I know exit polls are fewer than they have been in the past, and are now "adjusted" to match poll results. Is the "red-shift" still relevant anymore, or should we who want to somehow measure the legitimacy of elections find some other metric to use from now on? You've had Jonathan Simon on in the past, a well known documentor and analyzer of the "red-shift". Others such as Bev Harris, Bob Fitrakis, Harvey Wasserman and Mark Crispin Miller, have discussed the "red-shift" and its significance when it appears in our elections. Also----If the "red-shift" is indeed still a viable thing to look for via available methods (exit polls, esp), how can your listeners go out and detect it on their own in the 2018 Election that we now face? Where can we look, and what should we look for? In this all-important election, I fully expect the GOP and other operatives to stop at nothing to stifle any "blue wave" that might occur. While I am certain the GOP is erasing voters from the rolls in many states as I write this, I also expect black-box vote-tabulation rigging as well. I know there are more topics out there for you to cover than you are able to. But, IMO, it would be valuable to cover the questions and issues above relating to the "red-shift", and whether or not we should still look for it, or forget about it and look for other ways to measure election results. Gillum won his Florida primary after being quite behind in the polls. Were there any exit polls for that primary, and if so, was there any perceptible "blue-shift" in the results? Thanks for any response, Brad. Please forgive my (necessarily) terse reply today. For what it's worth, I've never been a big proponent of the "red-shift" theory. That's largely for two reasons: 1) It's based on Exit Polling from which data is very unreliable. Not unreliable because it's bad data, so much as it's not RAW data. It's often extrapolated from various postings of the data throughout the night, and that data is always "adjusted" to varying extents, even in its initial postings. They do not allow the public to have access to the raw data, so it's very much a guessing game to make sense of it. And 2) Because even if we can glean something about a "shift" from the Exit Polling to final reported results, it's virtually meaningless as far as usefulness beyond a red or yellow flag. It has proven, over many years, to be all but useful in court or anywhere else, beyond offering concerns about reported results. The ONLY thing (in my mind and 15+ years of work on this issue), that makes a difference is independently verifiable records of voter intent and whether that intent has been tallied and reported accurately. Similarly with the other folks you mentioned (all of whom are friends), I simply do not rely on statistical analyses like this to the extent that some of them may. So, watch those analyses as you like. Use them as potential clues for potential concerns. But remember that ultimately, only verifiable results make any difference in moving this needle. To that end, we must continue the fight for HAND-MARKED paper ballots everywhere and then the fight to publicly hand count them! I've been fairly consistent on that take for ALL of the years I've been doing this work! Gillum won his Florida primary after being quite behind in the polls. Were there any exit polls for that primary, and if so, was there any perceptible "blue-shift" in the results? If there were such polls, I am unfamiliar with them. If they exist (and that may, but I just haven't seen them amid a flurry of incoming stuff I'm trying to keep straight-ish all at once), I've not seen any analyses of them either. If such analysis exists, I'd be similarly skeptical of same for all of the reasons mentioned above. Hope that speaks to your central query and I'll be happy to follow up given another free moment that I can carve out somewhere, somehow! Thanks so much for your reply, Brad. No need for any further reply at this point. ---Even though the "red-shift" would be like a possible warning light or red flag, it's still better than nothing, if it can be "accurately" detected (and you express very legit doubts, that's why my quotes). ---Dang! This country needs some good HONEST, UN-Cooked exit polling. We certainly don't seem to be getting that now. I'm an oldie and I remember how super-well exit polls worked back in the 70s/80s. Could it be that human beings have changed since then, or is it that today's technology can't accomplish exit polls as well as past technology? or, is it rigging? I wonder if International election-monitoring would be feasible here (in terms of bringing exit polling that would release RAW data)? perhaps this is just grasping at straws? ---With hand-marked paper ballots, HANDLING and STORING them, even in the short-term (a few days or less), would be an issue that would need strict guidelines. Even the boxes where the ballots were held while voting continues until poll-closing time, and then through the following counting process, over a few days or so, would open a "Murphy's Law" situation. ...? Video-monitoring could be a key here. So there are other issues that would come up managing H-M paper ballots, which I fully agree would be the "Gold Standard" and should be pursued by us all. ---You sure have cool friends, Brad. FWIW, the Exit Polls done in the U.S. are not designed to ferret out fraud. They are designed to tell the news media (which pays for them) why people voted the way they did --- or the way the voting and tabulation machines say they did. The presumption is that the results are right, that there is no fraud in American elections, so the Exit Polling is just meant to tell us which democraphics for whom and why they did so. We do have international election monitoring here (at least in states where certain wingnut Governors haven't barred them), but even they do no Exit Polling. When you hear about it done abroad, it is almost always also by private pollsters (often the same companies that do it here in the US! ), but the polling, in some of those places, is sometimes specifically done to spot fraud, unlike here. You may have conflated hand-MARKED paper ballots with hand-COUNTED paper ballots (they're not the same) in your penultimate graf above. Yes, handling and storage must (or should) already meet strict guidelines. But if hand-COUNTING of, hopefully, hand-MARKED paper ballots is done correctly --- as we see in many New Hampshire towns, for example --- it's done at the polling place, on Election Night, before ballots are moved anywhere. If something happens to them, thereafter, that's a separate story, and a difficult way to game an election that has already been de-centrallly tabulated before the public. My cup runneth over, Brad. Maybe California and other states with many many items on the ballot could divide the ballot into 2 halves, with one ballot only having Federal races (Prez, Senate, Congress), and we could at least do hand-counts of those. California's elections have a huge number of races and ballot initiatives that make prompt counting very hard to do. But with just 2 or 3 races to count, on a separate ballot-half, rapid results could be accomplished. The disadvantage is that the lower races might not be counted manually, at least in the early years of such a policy, if such a policy could even be achieved. Maybe pushing for manual-counting of the most major races (Fed) to start would be practical? That would be a big compromise. Gosh, am I turning into a centrist, or what?